This is an exemplary model in the industry because of its portability. The tankless feature is the magnified component of Eccotemp L5 that distinguishes the heater from all others in the market. 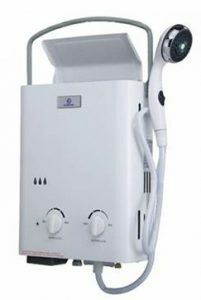 The tankless shower is integrated with outdoor shower, which makes it an irreplaceable equipment in camping and other outdoor activities. The water heater can easily be fixed on a trailer or cabin for people to enjoy unlimited hot shower. The 2 D cell batteries are not anything to worry about when it comes to durability of an outdoor shower. The batteries are easily recharged on any power source, whether through AC or DC. No matter how far in to the caves and forests you go, you can be assured of hot shower. With Eccotemp L5, you enjoy flexibility of water temperatures to your liking up to 35 degrees. The flow art is also impressive; a standard Eccotemp L5 has rate of 1.5 gallons per minute. 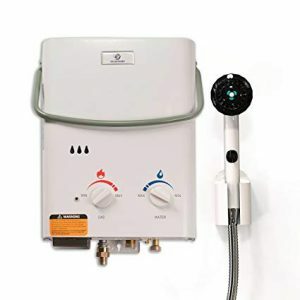 While the portability relates this water heater to camping and outdoor activities, you can also use it around the house. Eccotemp L5 can be used to wash your boat, wash your dog, and clean up your car with no hassle of running taps or spending on a cleaner. In fact, you will enjoy cleaning chores around the house because of the warm water and its efficient performance. The Portable tankless water heater can also be fitted on a pressure washer to increase efficiency and effectiveness of the cleaning process. Why the manufacturer used 2 D cell batteries is obvious, to cater for you when you are far off the grid where there is no electricity. If you like to take your vacations in a wood cabin down in the countryside where there is no one around, this can be a great partner and companion during your stay. You won’t have to postpone cleaning or showering because of water temperatures. Eccotemp L5 converts your deep forest adventure to a campsite with all resources. Warm water is everything you need when you are deep in the cold on a trip. Here are some of its distinguishing features that turn the wild to your home. The manufacturer was focused on outdoor activities when constructing this portable tankless water heater. Nothing could have been better than 2D cell batteries. These batteries last for a long time because they are only used sparingly when heating up the device to release propane. If Eccotemp L5 had a tank fitted, it would consume more power hence difficult to maintain it for several hours away from electricity connection. The battery guarantees you extended use of water for all the days you will be camping. Eccotemp L5 adds on to your packing list and things to do prior leaving home for camping. You have to make sure the equipment is fully charged; 5 to 6 hours of consistent charge ensures you full time service for several days. While its power durability depends on usage, any review on Eccotemp L5 won’t miss to mention the longevity and power sustainability of the product. If you have no electricity in your wood cabin, you don’t have to worry anymore. The 2D cell batteries are not only beneficial to camping enthusiasts but also for traditional uses in home. In fact, Eccotemp L5 comes in handy during emergencies and power blackouts. Propane is your only source of light and energy during such inconveniences. Eccotemp L5 has a compact and attractive design that makes it easy to carry it with your camping equipment. While they vary in sizes basing on manufacturer specifications on functionality, most of them are small and compact. The design helps in easy transportation and packing. You ca actually include it in one of your bags depending on the size. While it is fun in packing everything and going for camping, no one wants to carry unnecessary tools and forget the essentials. 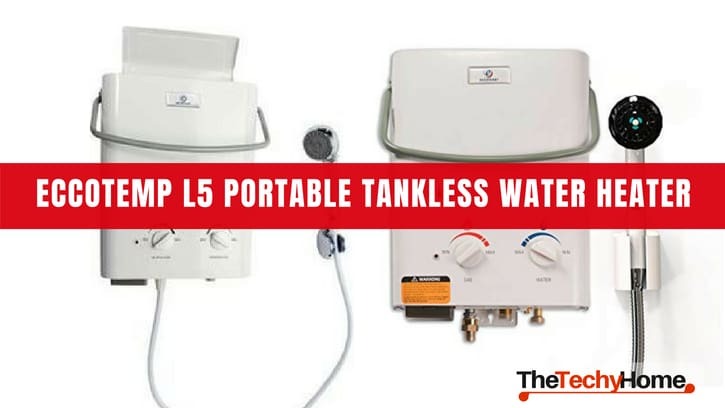 This is why you should list this portable tankless water heater on top of your packing list. Also, the compact design reduces risks of breaking some parts of the water heater thus a comfortable and worry free travel. 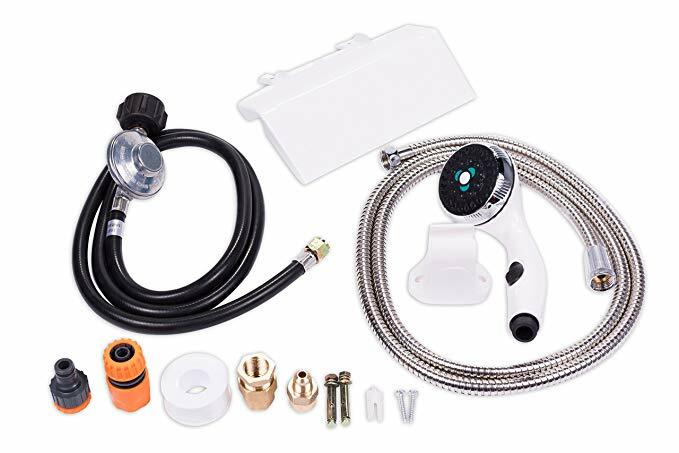 A gas regulator, hose, shower-head, garden hose adapter, and output water quick connects are all included with the Eccotemp L5. It is easy to fit all the adapters are removable features of the heater. While manufacturers always provide comprehensive manuals, you can figure this out by yourself. 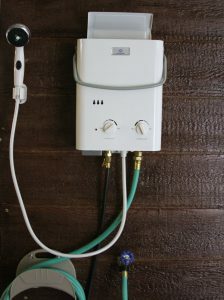 Identifying relating components and connecting them takes few minutes and your outdoor shower is ready. You only have to connect the heater to a propane tank and nose nozzle. After proper installations, the following is automatic. When water flows through the gadget, it triggers burners to shoot up and relax when water flows out. Consistency of water in your house is important in efficiency of portable tankless water heater. depends on pressure adjustments. The amount of pressure from the water source has a lot to do with temperature levels and flow rate. In case you are worried of water running throughout the night, Eccotemp L5 automatically shuts down after 20 minutes of consistent labor. If you love adventure and you have been restricted because of the thought of cold water from a lake, this is for you. Outdoor showers can be supported for a couple days during your vacation. Purchase this product and forget about geographical restrictions. Among all water heaters, Eccotemp L5 is the most suitable if you like outdoor activities. The flexibility and affordability of this equipment is incomparable. The Propane and tankless feature makes it the best. Take a look on Amazon as they may have put a discount on this water heater. Click here to go to its page.